This wasn’t a figure I had planned on getting. If anything, I planned on getting the movie version. However, after finishing Essential Iron Man Volume 1, I changed my mind. I’d never really been an Iron Man fan. I’d be lying if I said the movie didn’t have anything to do with it. Of course, I also have different tastes than when I was a kid, so who knows. 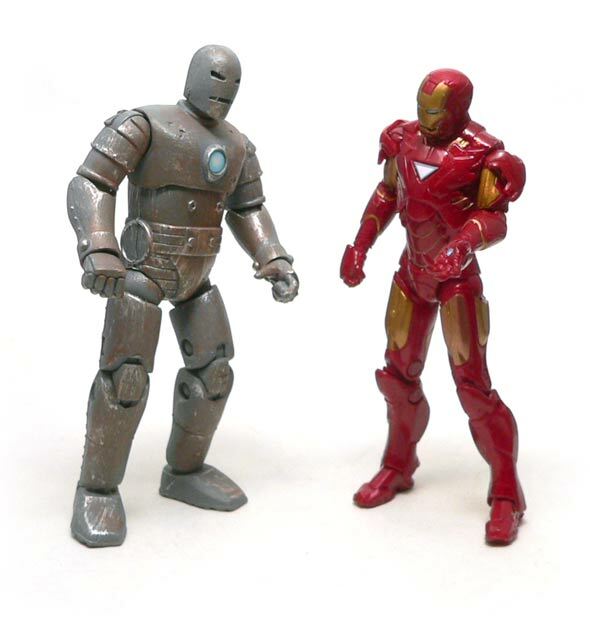 The original version of Iron Man looked very much like a suit of armor. It’s exactly what the name evokes, a suit of Iron with a man inside. 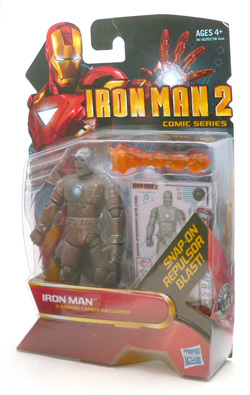 I always thought it was ironic that the moder version was still called Iron Man, since I doubt much of his armor is actually made from ferrous material. The figure does a great job of pulling the look off. It’s big and bulky and there’s nothing on it that could be called sleek. The suit is fairly minimalist to match the original art work. There are rivets here and there and a few seems as well. The belt is fairly comic accurate, although I wish it stood out a bit more. 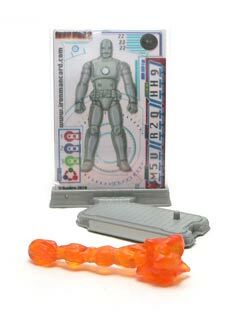 In the early days, Tony Stark housed a number of his gadgets in his belt. The chest has some port connections that look good. But, I really love the dent just to the left of the ARC light. It just really adds some realism and depth to the overall look. The back has some panels as well to break up the plainness. Again, it’s a pretty good approximation of the comic look. 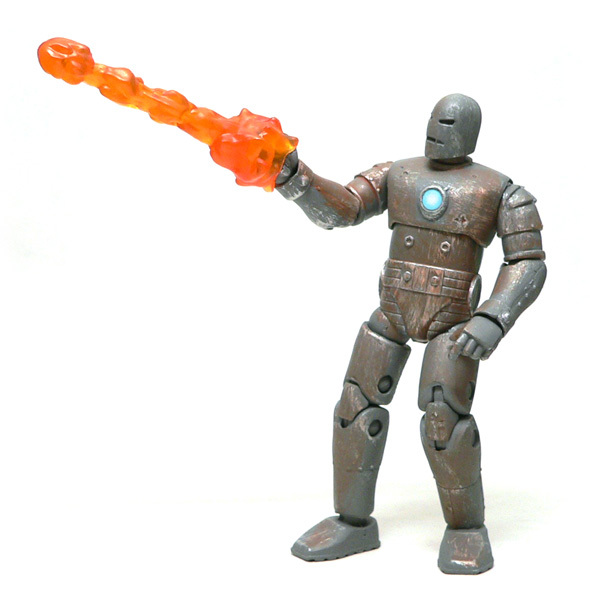 The head of this version of Iron Man is pretty dead on. I love the fact it is so plain. It really is more function over style. The depth on the eyes and mouth pull of the metal cutout look well. It’s really nice to see this version plays right into the Mk 1 movie version. One of the things that really sold me on getting this figure was the paint. The look on the front of the figure is pretty cool. He’s got a lot of rusty wash going on there. It adds a nice patina to the figure that really gives it a worn look. In addition, there are silver scrapes here and there. These give an illusion of more recent activity of the battle kind. However, this figure has one of those issues that Hasbro seems to have from time to time. The back doesn’t match the front. Where the front is a nice bit of paint work, the back is almost entirely plain. It’s like he was facing all his battles from the front and his back never gets touched. I’ve loved almost all of the Iron Man figures I’ve picked up. They’re all figures you just have to pick up and pose if they are sitting on your desk. This one is no exception. I love the fact that this figure just wants to take those classic comic poses. No, he’s not the most posable figure. But, this isn’t the most nimble of the Iron Man suits either. 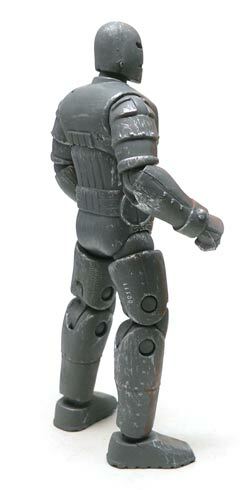 Yes, the knee joint is a little obvious on this figure. I’m not that inclined to worry about it, since it just seems like the mechanics of the suit. In addition to the stand and cards included with this line, he also comes with a fire blast effect. This is something I think that looks a little too modern. I would have love to have seen something a little more retro art looking for this. It works, though. 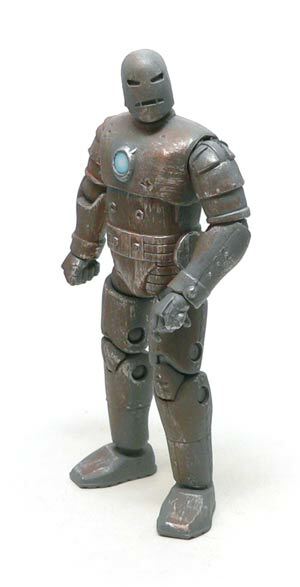 Except for the unpainted back, I really don’t have any complaints about this version of the armored Avenger. He’s a great representation of the vintage comic book look. It’s obvious that somebody was a fan when this figure was created. The look and articulation work great together to create a figure that is both fun and a neat display piece. Every time I go to a store I invariably find half a dozen of these clogging up the pegs, sometimes discounted, sometimes not. Thus far I have always found something or other more deserving of a purchase, but after reading your review I really think I should give this one a closer look the next time I find it on sale.